Redken Diamond Oil Glow Dry Gift Set is the perfect gift to give to anyone with any hair type that wants to enhance their hair style. 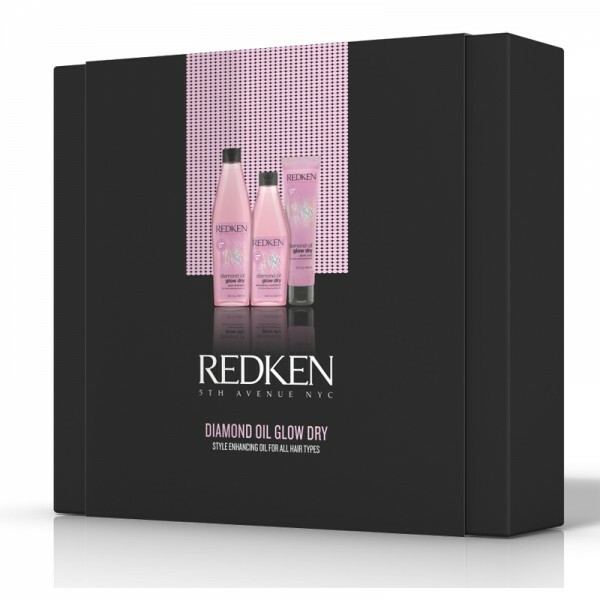 Enjoy airy and sparkling hair with the Redken Diamond Oil Glow Dry Gift Set. Formulated to with a multi-faceted diamond-like shine. Diamond Oil Glow Dry Shampoo 300ml: Redken Diamond Oil Glow Dry Shampoo is an oil enriched gel shampoo that leaves hair feeling airy and sparkling with a multi-faceted diamond-like shine! Diamond Oil Glow Dry Conditioner 250ml: Redken Diamond Oil Glow Conditioner is an oil enriched detangling conditioner that lightly moisturises to add weightless shine. Diamond Oil Glow Dry Scrub 150ml: Exfoliating is not just for your skin. Polish away dull hair with this pre-shampoo gloss scrub, perfect to smooth and detangle before shampooing.